What a difference 24 hours can make - even without Arsenal having kicked a ball. 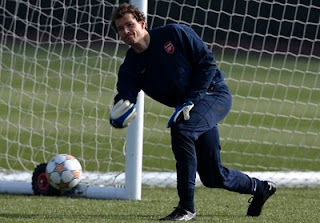 The news coming from the club yesterday that Jens Lehmann was in talks with Arsene Wenger to join the club until the end of the season has certainly given us a boost. I think I'm a good barometer of the mood and opinion of other Gooners and I've heard nothing but positive vibes about the return of the German, despite what The Sun are saying. The fact of the matter is we need an experienced goalkeeper to come in and sit on the bench for the next six weeks at least - possibly longer given the injuries to Wojciech Szczesny and Vito Mannone. We need someone who knows the Arsenal set up so they don't need time to adjust and we need someone who knows Premier League football and has played at the highest levels of the game. Lehmann ticks all those boxes. With Jens undergoing fitness tests at London Colney for the next day or two, don't expect the announcement of his signing to reach Arsenal.com anytime soon. Do expect to see his name on the squad sheet for the West Brom game this Saturday. Martin Keown writing in the Daily Mail believes Arsene Wenger has made the right call. "[Jens is] a good communicator and excellent at identifying which of his team-mates are giving everything and who could offer more. "If something needs to be said, he'll say it." Lehmann has been there and done that. He's got the winners medals. Whilst his last spell at the club was about competing to be number one, the German knows that he is coming in as Almunia's understudy. He'll train hard and provide the Spaniard with his support. There won't be any issue with the two men getting on. Times have changed and people have moved on. Personally I'm happy with the choice of Lehmann. It'll be great to welcome him to the Grove on April 2. Elsewhere, England manager Fabio Capello has been talking glowingly about Jack Wilshere and has marked him down as a future captain of the national team. Whilst there is talk of the 19-year-old playing in the Olympics next Summer, after possible involvement in Euro 2012 - if England qualify. That would mean no rest between the end of next season and the start of the 2012/13 campaign. At the moment who knows what the future might hold, but having a player perform to their highest level after a grueling domestic season followed by an international tournament and then to go on to the Olympics.... it just seems all too much. There is talk of not burning out our young players... so lets hope this doesn't happen. There is continued talk about how we can pick ourselves up from going out of three trophies. Matt Law of the Daily Express think Arsene Wenger should have someone at the club willing to challenge him. Whilst Richard Williams at The Guardian believes our problem lies with Wenger picks to wear the captain's armband. Early team news ahead of our trip to the West Midlands suggests that Theo Walcott won't make it and neither will Alex Song, who still has a knee injury. Finally, it appears that Blackburn are after Nicklas Bendtner. They are willing to pay us £15 million for him, according to the Daily Mail. Considering Newcastle were prepared to pay £18 million in January for the Dane, I feel Rovers are under valuing him. I know many Gooners would snap of their hand for the money, but I like Bendtner and would love to see him at Arsenal next season.